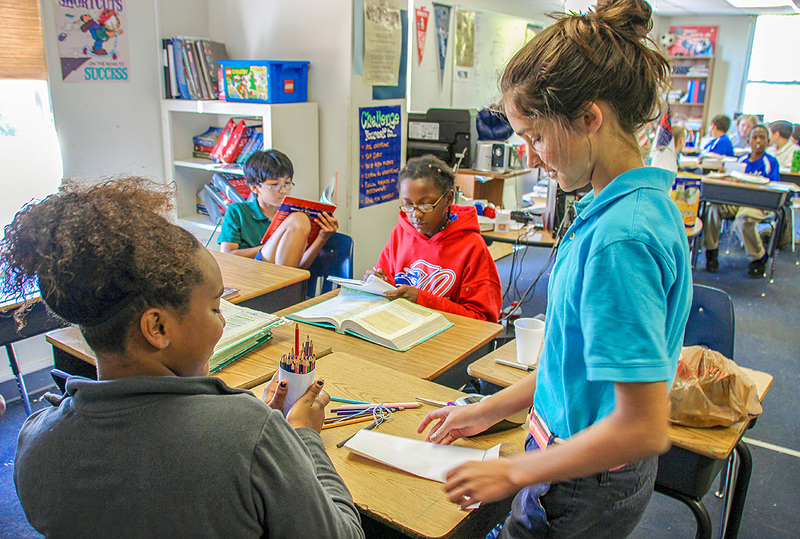 Desmond T. Doss Christian Academy is committed to providing classroom instruction that meets every student’s need. With the exception of Kindergarten, the classes at Desmond T. Doss Christian Academy are arranged with two grade levels per classroom. Our teachers are experienced and trained to teach multigrade-multiability groups. It has long been established in education that smaller class sizes and homogenous grouping is best practice for students to thrive. Our multigrade classes are limited in size so that our teachers can meet individual needs in creative ways. In many ways teachers in Adventist schools have always provided “differential” instruction, which is a buzzword currently in the field of education. By definition differential instruction is modifying curriculum and individualizing instruction in systematic and creative ways. Multigrade classes actually help make differentiation possible. There are other special advantages to multigrade classrooms. Not only can flexible student schedules be implemented, but also unique programs can be developed to meet students’ individual, group interests, and needs. For example, at our school it is not unusual to find gifted kindergarten students spending part of their day with our first graders, or a second grader who is great with numbers taking math class with the third graders. Combined classrooms also offer ample opportunity for students to become resourceful and independent learners. Our setting lends itself naturally to peer grouping where stronger students help their friends and learn leadership skills. Multigrade classrooms are usually less formal than single-grade classrooms. Because of the small class size, friendly relationships based on understanding and respect develop naturally between the students and their teacher. In this setting, students become well known by their teacher and are surrounded by a family-like atmosphere. Our teachers and family members feel like a team working on behalf of our students. Whenever possible we try to find ways for our older and younger students to learn and spend time together. Among other ways, we do this by incorporating reading buddies and pen pals between classes. We like to group all the students together across-ages during worship services and on the playground. Our little kids look up to our big kids. Our big kids remember what this was like for them and take care to treat our little ones with TLC. In this way, there is rarely any kind of bullying. In addition, there is genuine fondness for each other between all the students on our campus.